Hans Christian Andersen once said, “Just living is not enough... one must have sunshine, freedom, and a little flower.” This sentiment is what draws campers into the woods all year round. (That, and maybe the opportunity to have a bit of a party!) 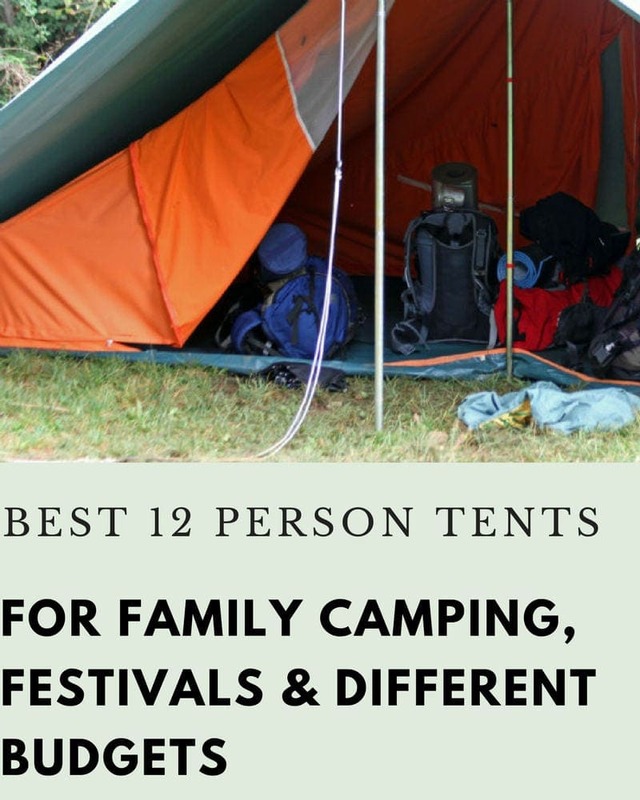 There are few things more fun than sharing a group camping experience so I’ve pulled together a list of the best 12 person tents; looking at the most important features like space, privacy, weather-proofing and value-for-money. Room for 3 queen-sized air mattresses! Why would anyone need a 12 person tent? What to consider when buying a 12 person tent? Browning Camping is an ALPS Mountaineering brand that focuses on seriously good build quality. Their gear is designed to tough out the most punishing weather season after season after season. That means this is an extremely solid tent that will last you for years. So it's not something I'd buy to go to a music festival; this is a tent I'd recommend to families who have (or plan to have) a regular outdoor vacation. It’s got a great layout that splits into two rooms by way of a removable divider. Each room has a private entrance and 3 zippered pockets. As a family man myself, I know the importance of having a bit of privacy. And I know that privacy is hard to come by out camping. That's where the removable divider comes in; to give anyone almost instant privacy. The only criticism I have is really minor (but a bit annoying): the windows on the doors don’t have any toggles to hold them open. (The main doors have toggles. The windows have toggles. But the windows on the doors don't). As I say, minor quibble. The thing that I think is really awesome about this tent is the price:durability ratio. In a world where we are all too used to throwing things away after a couple of uses, it's really refreshing to see craftsmanship in action. It's a great design, it's sturdy and in the unlikely event of anything going wrong, the customer service is second to none. If you're just looking something big and cheap, this ain't for you (check out the Tahoe Gear 12 instead). But for anyone looking to invest in large tent they want to use for many, many years this is an excellent choice. It's comfortable, reliable and is the sort of tent that will make memories. This tent is relatively easy to set up because the poles are pre-attached to the tent. So in theory you just unfold the tent and extend the poles. I say "in theory" because it's not quite as "instant" as the name suggests. And you do have to be careful because if you damage any of the poles, that's going to affect the whole instant mechanism. But once you get the hang of it, it's a pretty smooth ride. Once assembled, you can create three rooms plus a front awning. Each room has large windows and can fit a queen size camping cot. Overall, you can fit up to 12 sleeping bags inside. So it's pretty huge! It is a "value" tent and so suffers from many of the same things that any budget tent does. With that in mind you may want to upgrade it with a tarp to protect the floor and some higher quality tent stakes. It's also worth considering swapping out the standard guylines with hi-visibility paracord and giving it an extra coat of tent sealant to be on the safe side. If you're on a budget and are looking to buy a big tent for occasional use, this will work well for family trips, car camping and festivals. It will keep you dry and you will be comfortable. But it won't last forever. You can upgrade the tent with your own accessories to extend the lifetime of the tent. But if you're looking for a something that will last years you may prefer to look at the Browning Bighorn. It is an absolute breeze to set up! And it’s large. It divides into three rooms with wall storage and a gear loft. It can fit three queen size air mattresses or 12 sleeping bags. You’ll appreciate some of the thoughtful features like an electrical cord access port. It’s really heavy. Heavier than it should be in my opinion. And despite that, it doesn’t stand up to wind as well as you might think. This tent works best for warm weather camping and for sheltered sites. It’s size and easy set up count in its favor, and it's an awesome option for occasional summer camping and festivals. But if you're worried about the weather or plan to use the tent in the winter, there are better, more durable alternatives. This tent is a great value-buy. It’s nothing fancy but it’s really roomy; you’ll have no bother fitting in numerous blow-up mattresses plus kids plus dogs. You can use it with or without the fly for stargazing. With the fly on the windows don’t make you feel enclosed. It’s perfect for backyard camping. The simple set up also means that it’s light on features. The kit does not include any special pockets or access ports. It’s also not going to stand up brilliantly in very windy or very wet conditions. If you’re on a budget and you’re looking for something you can use occasionally in the summer, you could do a lot worse than this tent. But if you think the weather will be against you, or if you are looking for heavy use, you may want to spend a little more. As large tents go, this is a really good one! It’s super-spacious and it can be divided into two large rooms using a detachable divider. Two people can set it up fairly quickly (and actually, it’s easy enough that one person can get it up on their own). It’s a great choice for bug protection as the mesh is very tight and the floor is reinforced. This tent contains one frustrating design flaw. The windows only open and close from the outside. So, you will want to zip or unzip them before you settle for the night. However, that aside, once it is set up, you’re off to the races. You want something durable that’s going to work for you in a variety of different conditions. The windows on the top are fun for stargazing. Overall, the tent has an open feel that will keep you dry and keep out bugs. Simple set up and a huge interior space. The open L-shaped layout gives you privacy while keeping you in the same space. This tent is not easy to set up and the stakes have a habit of popping out. If you prefer an easy camp in a warm climate, this tent works well. If you are travelling in the desert with your family or going to a festival with friends it’s a decent budget buy. Big camping trips require a lot of sleeping space. While you can pack several smaller tents to house your many guests, there are several advantages to bringing one large tent. First, you get to keep everyone together. If you are camping with kids, it’s convenient to keep them in the same space. They won’t need to move from tent to tent during the night if they need assistance. Second, you end up packing less. While one large tent takes up a lot of space, it’s actually less material than several small tents. Also, you may have less weight overall. Third, a single tent simplifies set up. You don’t need to coordinate the packing, placement and set up of several tents. Instead, you just bring one kit and set it up. If you are traveling with as a family or a group of friends, a 12-person tent saves you set up time and packing weight while keeping everyone together. When you buy a 12 person tent, several factors play into your purchasing process. First, the size and weight of the tent impact your ability to travel. Second, the durability and tent material influence when and where you can camp. Third, the layout of the tent impacts how many people can sleep inside. Although you may play a late night card game inside the tent, you’ll probably just lay out sleeping bags for bedtime use. Ideally, your tent will be large enough to accommodate 12 people while being light enough to manouver into a campsite. Most of the time, a 12 person tent will be about 150- 200 square feet. Manufacturers typically divide these into several rooms for privacy. Each room may easily fit between 2-4 sleeping bags. Also, your tent should be light enough for two people to carry and set up. Most tents of this size weigh between 30-50 pounds. That’s a lot heavier than a 2-4 person tent. 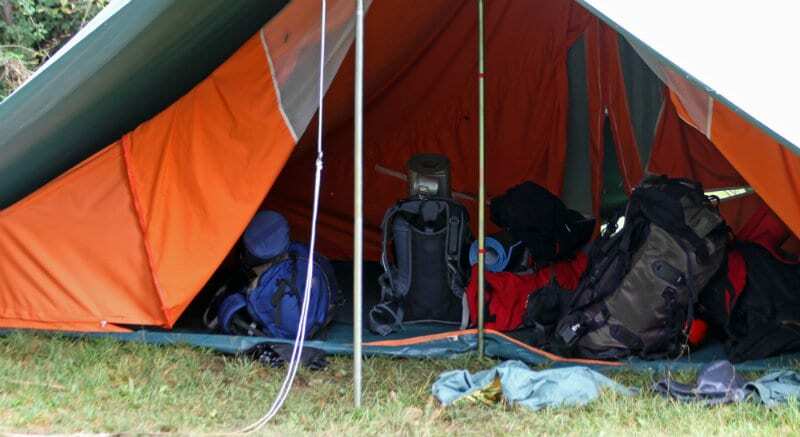 As you are setting it up, the folded portions of the tent can be difficult to manouver. So, you’ll want to look for a tent that is easy to fold and unfold. Otherwise, the large size and heavy weight combined with an awkward design will make set up and take down unpleasant. For recreational campers, nylon or polyester tents will last them several, moderate weather seasons. Typically, these tents have mesh windows and air vents meant for warm weather and light rain. Although they can be sealed using toggles and zippers, these coverings only keep out bugs. They won’t keep you warm in a harsh environment. Large tents come with room dividers making several spaces. Some even have a room with mesh walls that can act like a porch. As you consider tents, think about how you will use the space. For example, if you are travelling as a family, the parents may want their own room separate from the kids. Also, if you travel with friends, you may just want one large space that fits a long row of sleeping bags. Whatever your preference, you can find a tent that works well for your camping needs.